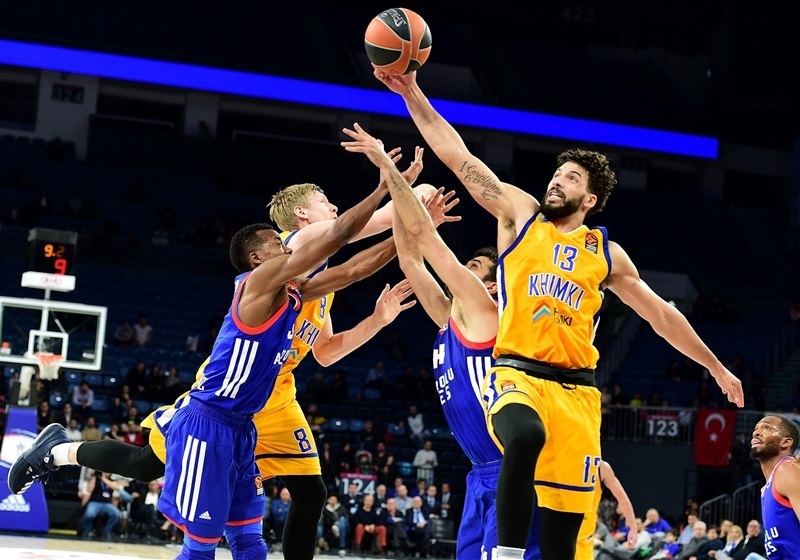 Khimki Moscow Region will play in the Turkish Airlines EuroLeague playoffs for the first time after defeating Anadolu Efes Istanbul 73-85 on Wednesday at Sinan Erdem Dome to lock up a spot among the top eight teams. Khimki trailed by as many as 13 in the first half and did not take its first lead until late in the third quarter. After the score was tied five times in the fourth, the visitors went on a 2-13 tear to finish the game and earn a playoff berth. 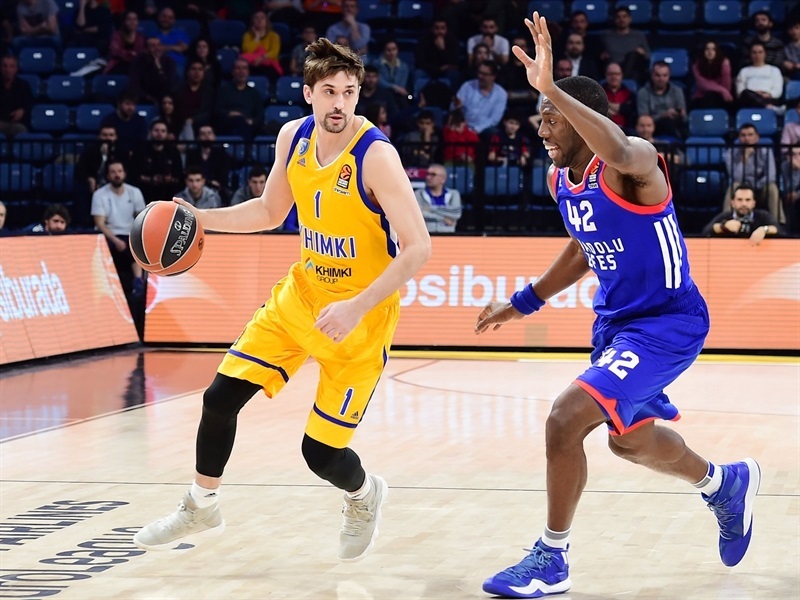 Khimki improved to 16-11 and will enter Round 28 as one of four teams tied for the fourth-best record in the competition. Last-placed Efes fell to 6-21. 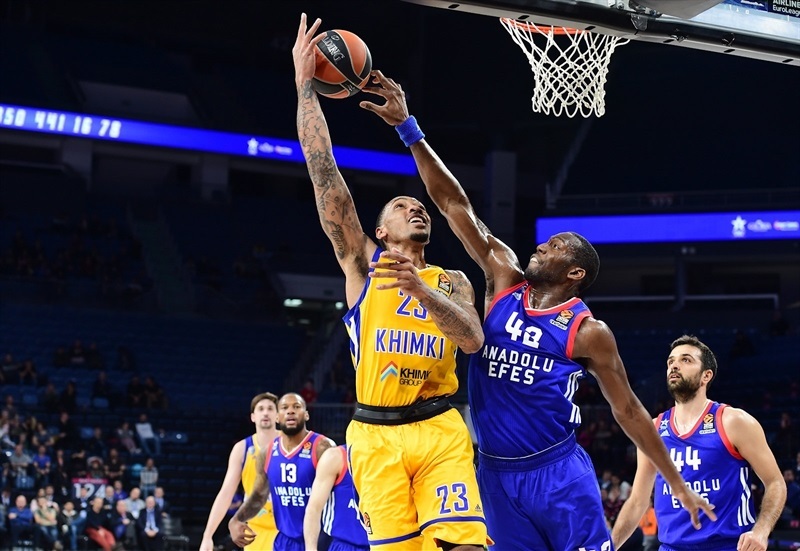 Malcolm Thomas led five Khimki scoers in double figures with 17 points, Alexey Shved tallied 16 points, 8 assists and 3 steals, Egor Vialtsev added 13 points, Anthony Gill posted 11 points and 7 rebounds and Charles Jenkins scored 10. 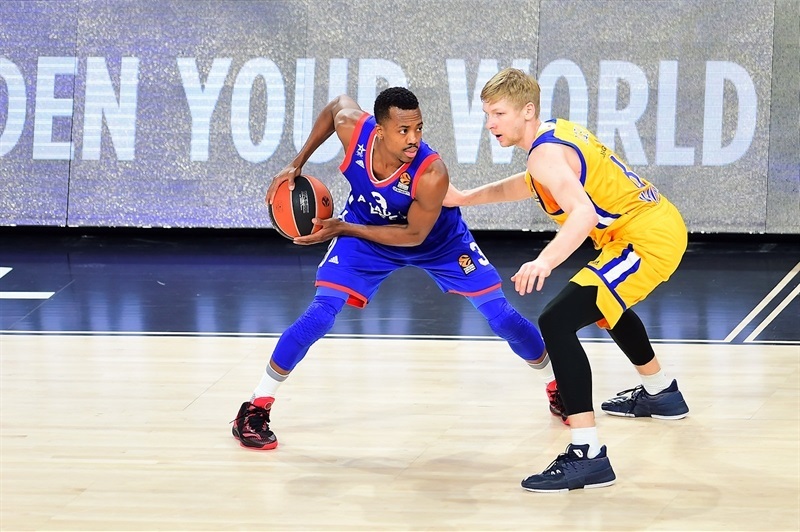 Bryant Dunston paced Efes with 19 points, 7 rebounds and 2 blocks, Sonny Weems added 16 points and Brock Motum and Errick McCollum scored 11 each. Motum had the hot hand early with 5 points and then Weems heated up with 5 more as the hosts grabbed a 12-6 lead. 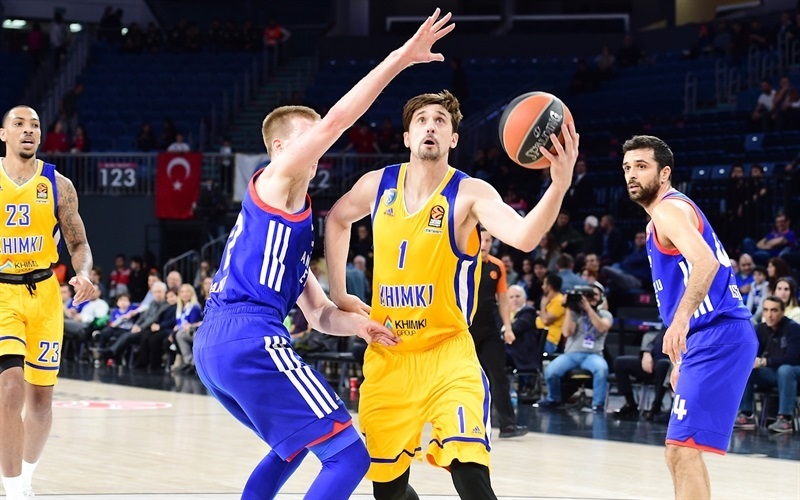 Efes kept Shved from shooting for nearly five minutes, but then he hit a long three and a layup-plus-foul to bring Khimki within 14-12 midway through the opening quarter. 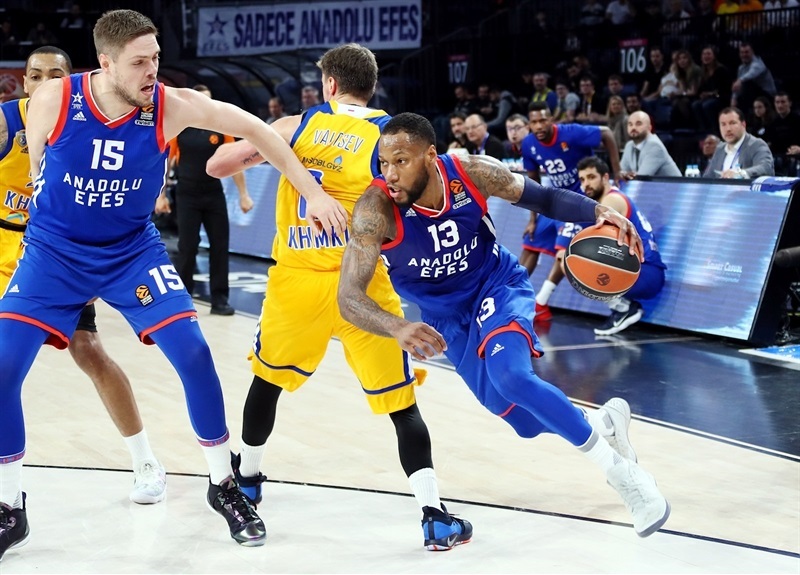 Efes reeled off 11 unanswered points, including a three from Krunoslav Simon, and took the game's first double-digit lead on a coast-to-coast layup by Motum. Dunston's put-back made it 25-12. 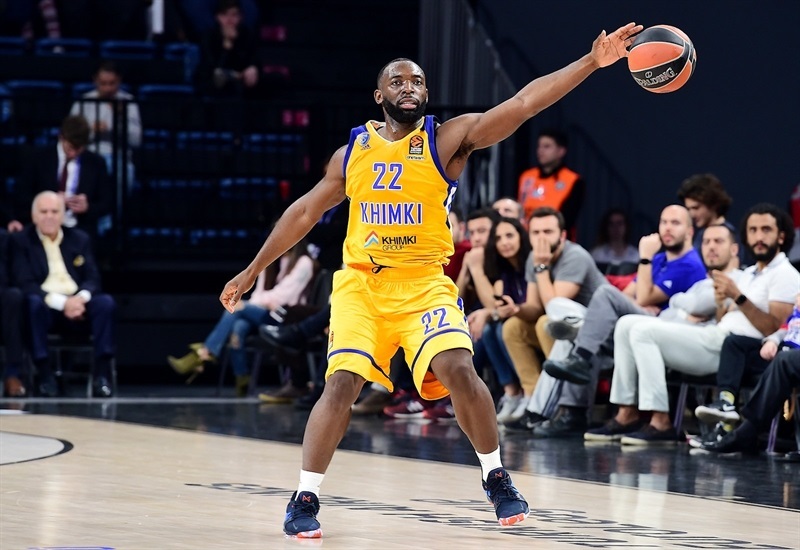 Jenkins ended the Khimki drought, but Dogus Balbay's third steal of the quarter led to a layup by Weems and a 13-point advantage. A layup by Vialtsev got Khimki within 29-18 after 10 minutes. Dunston put his stamp on the game with a big dunk among his 5 points in in the first minute of the second quarter. He also blocked another shot as Efes started to coast. 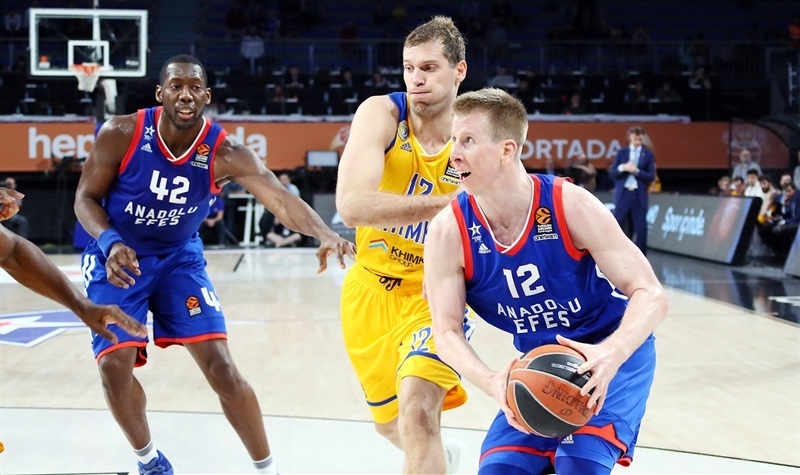 Khimki was able to keep Efes scoreless for four minutes as Jenkins hit a triple and Thomas a three-point play to close the gap to 34-28. Jenkins and Thomas remained hot to bring the visitors within 3. Simon raised the difference back to 8, but Thomas free throws and a Shved-to-Gill alley-oop slam had Khimki rolling again. After McCollum and Vialtsev traded threes, McCollum free throws gave Efes a 49-42 halftime advantage. 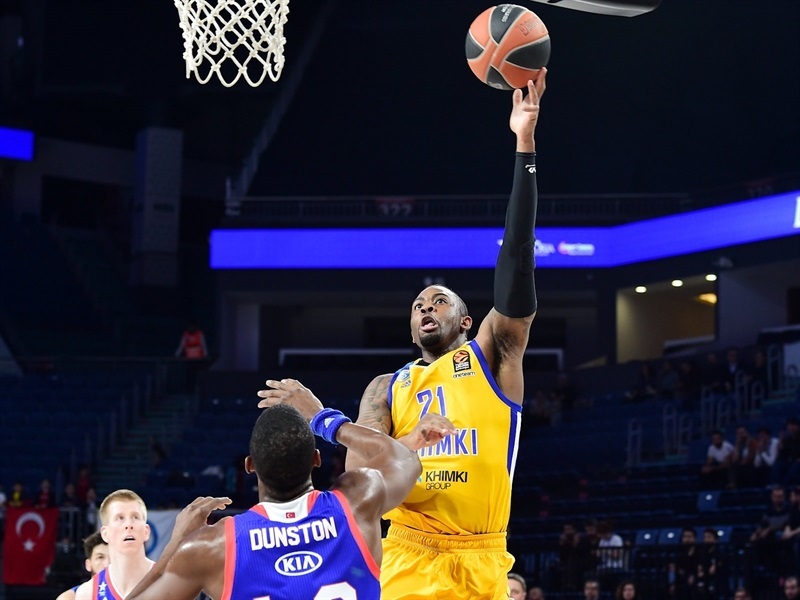 Jenkins with an assist to Thomas and a pull-up jumper of his own got Khimki going in the second half, but he was then whistled for an unsportsmanlike foul on Dunston, after which Efes pushed its lead up to 53-46. Back-to-back triples by Shved and Gill made it a 1-point game. Gill split free throws to tie it at 55-55 with four minutes left in the third quarter. 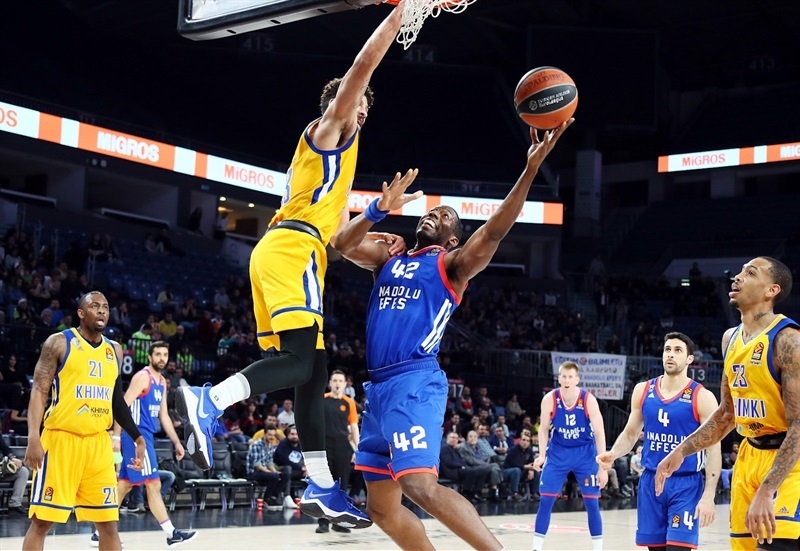 Motum free throws put Efes back ahead, but a three by Gill gave Khimki its first lead of the game, 59-61, with a minute remaining in the quarter. Weems evened the score at 61-61 through three quarters. The teams traded scores for the first five minutes of the fourth quarter, during which the score was tied five different times before Stefan Markovic's three-pointer made it 69-72. 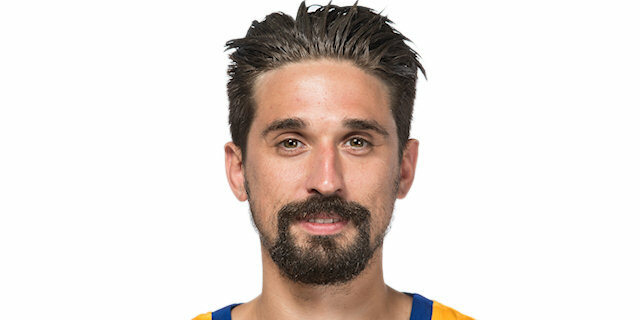 After Vladimir Stimac free throws, Shved drained a three-pointer and Vialtsev added a layup to give Khimki a two-possession lead for the first time, 71-76, with 3:49 to play. A Vialtsev triple a minute later all but wrapped up the win and his third of the game established Khimki's first double-digit advantage, 72-83, with a minute and a half to play. 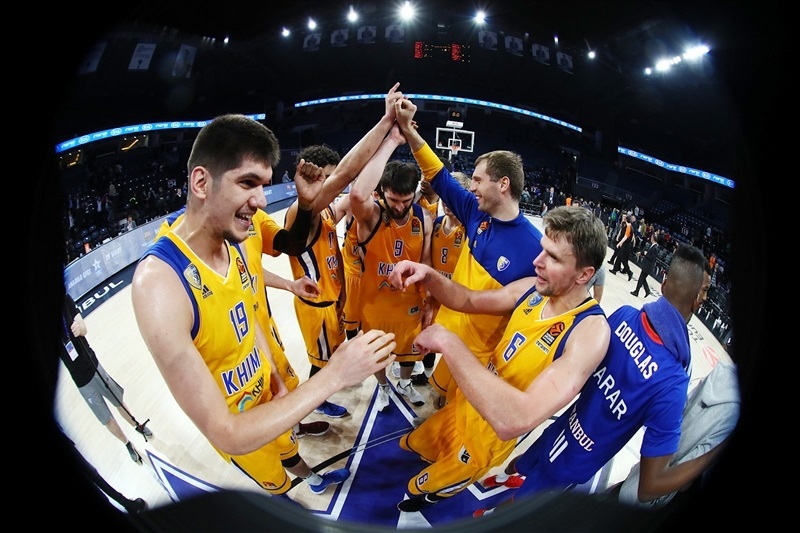 Khimki finished the game on a 2-13 tear to clinch a playoff berth for the first time. 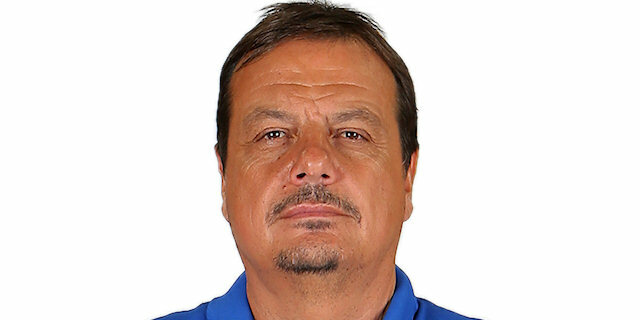 "I would like to congratulate everyone in our club: the president, sponsors, players, my colleagues, the front office, because it's a big moment for our club – the first time in history we've qualified for the playoffs as one of the top eight teams in the EuroLeague. We have also achieved this, I think, in the most difficult EuroLeague ever, playing against the best teams in this new format. If we see which teams are behind us in the rankings we can realize what a big achievement it is. On the game, we had a lot of pressure in the first half when we allowed almost 50 points. We were hesitating on defense and offense so we gave an opportunity to a talented team like Efes. But in the second half it was a dominating performance on defense – we gave them only 24 points, their field goals were 30%, we forced them to make 8 turnovers and generally played the game like we had to play in a game that was like a final for us. We also had nearly 30 assists so you can see how well we shared the ball. I think we have seven wins on the road – that’s credit to the players. Now we have three games more to finish, so let’s fight in every game to the end to see where we can finish. What I’m trying to build up in this team is, no matter who we play, to fight to win. You just have to have principles. 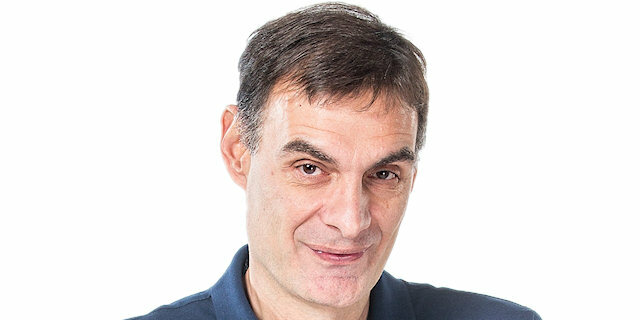 Of course we have ambitions, but honestly, knowing how good this EuroLeague is, it’s very difficult to achieve the playoffs and a big accomplishment for the club. So right now, for one night, let’s be satisfied with this." "They played really good defense all game. Just the last three or four minutes, I don’t know what happened, maybe they were tired and maybe we played a little better. It’s a tough game here and they played great tonight. This was an important game for us. We always have pressure. This is the first time for us to go to the playoffs. This game was really important for us. We tried of course to win, but we started not really good and they started great and scored a lot of points. We are just happy to win tonight."